While I do my fair share of driving across the Bay Bridge, it’s not often that I get to run across it. 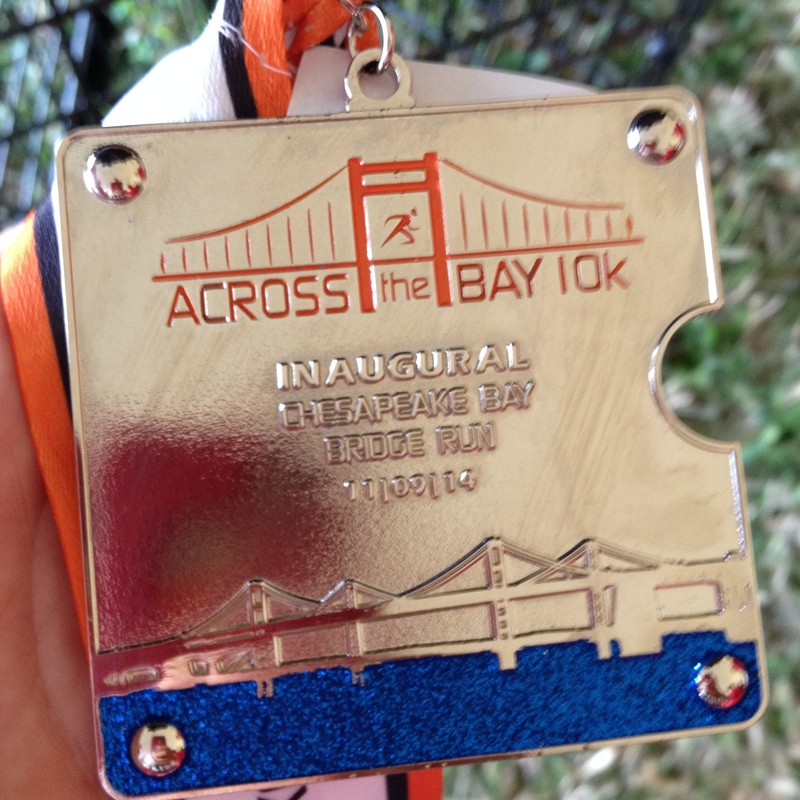 So, I took that opportunity on Sunday, and participated in the Across the Bay 10K with thousands of other runners. As I believe I noted in a previous blog post on The Road to a Marathon, I had actually been hoping a run would return on the Bay Bridge — formally known as the William Preston Lane Jr. Memorial Bridge, although around here it’s known as “the bridge” — since I ran it in 2006. I thoroughly enjoyed the 2006 run, which was known as the Governor’s Bay Bridge Run, when I did it that year. I even signed up the following year, only for my mom and me to drive about an hour out there from my former home in Hampstead, Maryland, to have it be canceled due to high winds. I’d also done the walk across the bridge as a child at least one time, I believe in 1998. 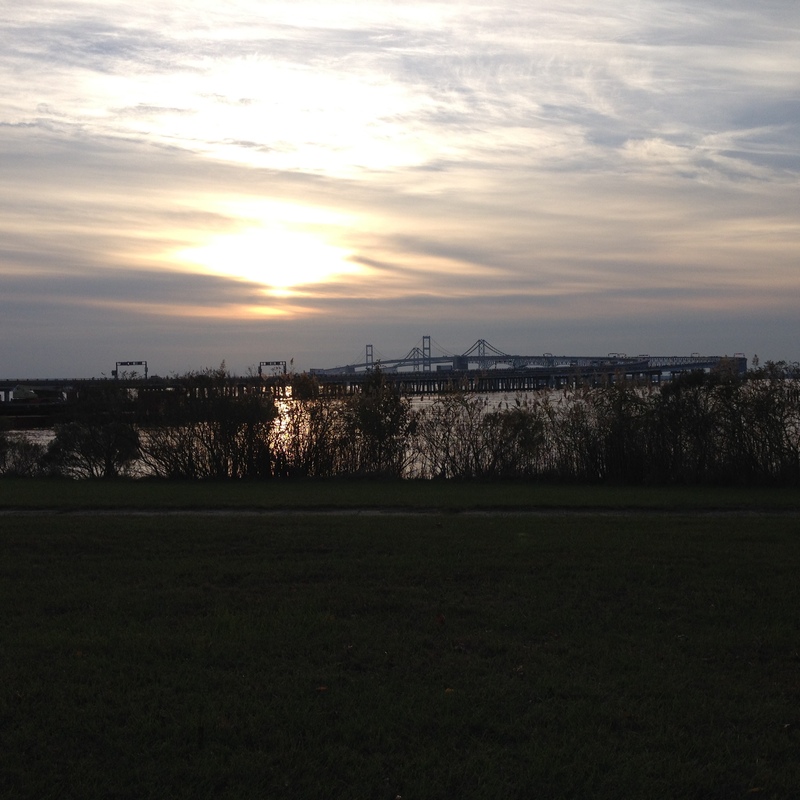 I was excited to see that the Across the Bay 10K was a new race that would allow runners to run on the bridge that goes over the Chesapeake Bay — which for any non-locals connects the Eastern Shore with the rest of Maryland — again. I signed up more than a year ago for the inaugural 2014 event, on the first day. 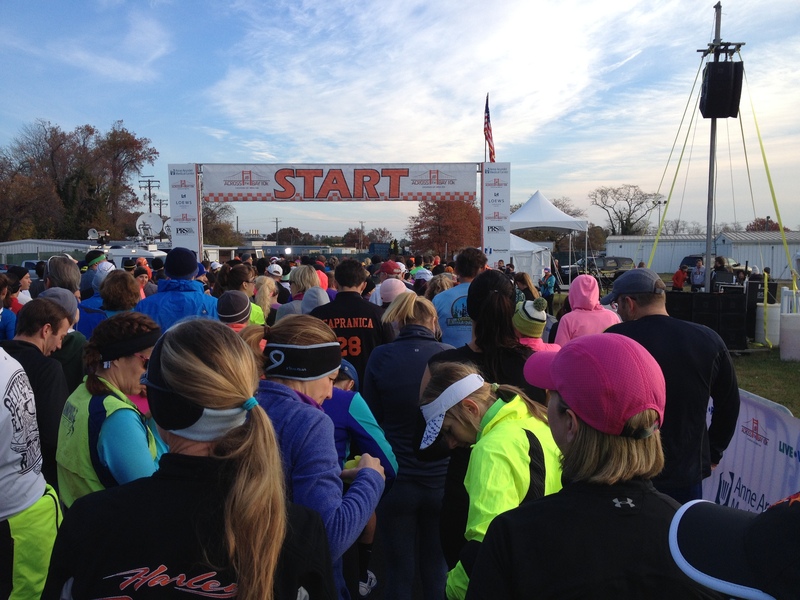 I was a little worried about how race day would go with so many people with parking and the shuttle, and there were some things I was a little frustrated about ahead of time — no Eastern Shore packet pickup and a cost to pay for parking on race day — but everything went well, and I had a great time. 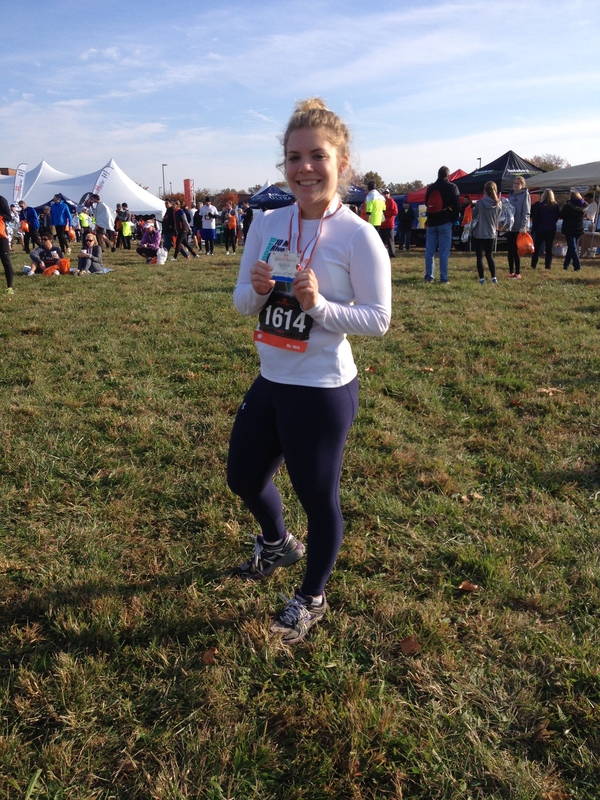 My friend Veronica and I stayed in a hotel in Kent Island and were very close to one of the runner parking lots. We got there early and were able to board the first bus. The bus was delayed due to security staff not arriving when they were supposed to, but we still made it in time for the run, and, as I’ve seen at least one other person note on social media, there were plenty of portable toilets at the start and no lines — something that all runners know is important. The beginning of the race was more laid back when I expected: It was being announced that people assigned to any wave who were by the start area could start earlier if they wanted to. Veronica and I started with the second wave. I had been deciding whether I wanted to take pictures during the run or give it my all and run a fast 10K. In part because I expect this to be my last race of 2014 other than the Rehoboth Beach Seashore Marathon, I decided to run the 10K and see if I could break my goal of running a 10K in less than 50 minutes. My three goals for 2014 were to break my 5K personal record (I did that), run 1,000 miles (I am less than a mile away) and run a 10K in less than 50 minutes. I’ll be carrying over my 10K goal to 2015, as I didn’t quite make it. We started in the second wave, and I knew we had started at about 7:25 a.m. (I later saw Veronica’s watch had a 7:26 start time.) When I got to the finish line, I saw that the clock read 1:06-something. So, I really wasn’t sure if I had met my goal, but I was hopeful that it was potentially a possibility with the chip time. Thankfully, chip times were available right away at a tent. As the man typed in my number and I saw the receipt-like paper slowly print out, I was really hoping I might see a 49:59. However, the number was 50:20: Twenty-one seconds away from the goal, but a time I still feel good about. That’s an 8:06 average pace, which is still a really great run for me, and my second-best 10K time. Hopefully, the course was 6.2 miles. Veronica’s watch had a little under, while I saw some social media posts that had the distance as a little over. So, I’m going to go with 6.2 miles, since I didn’t wear a watch. I prefer not wearing a watch for races now because I have found that I am much less stressed out and can fully enjoy the race while listening to my body. Not long into the race, my shin started hurting not a lot, but a little bit — something that has happened the previous two times I have run. I thought it may have been brought on by switching to new shoes, so I wore my old shoes that I have been wearing for months. Unfortunately, this meant a very brief stop to roll out my ankles and try to get rid of the pain. I hated stopping, but I figured I’d only be slowing myself down and causing more pain if I continued to run on it. Plus, it was very brief. It seemed to help, and I especially enjoyed the downhill part of the bridge after the gradual incline to the bridge’s highest point. I remembered that when I did the run in 2006, I could feel the bridge shaking. That was not the case this year, and I don’t know why. The race used to be in May, so it’s a different time of year, and it wasn’t windy: Maybe those things have an impact. Oh, and I did beat my 2006 time — that year (as a 15-year-old) I got 53:41. The course was different for the Governor’s Bay Bridge Run, though, and I’m pretty sure it went the opposite way. We ran west to east this year. The course is longer than just the bridge, since the bridge is about 4.35 miles. 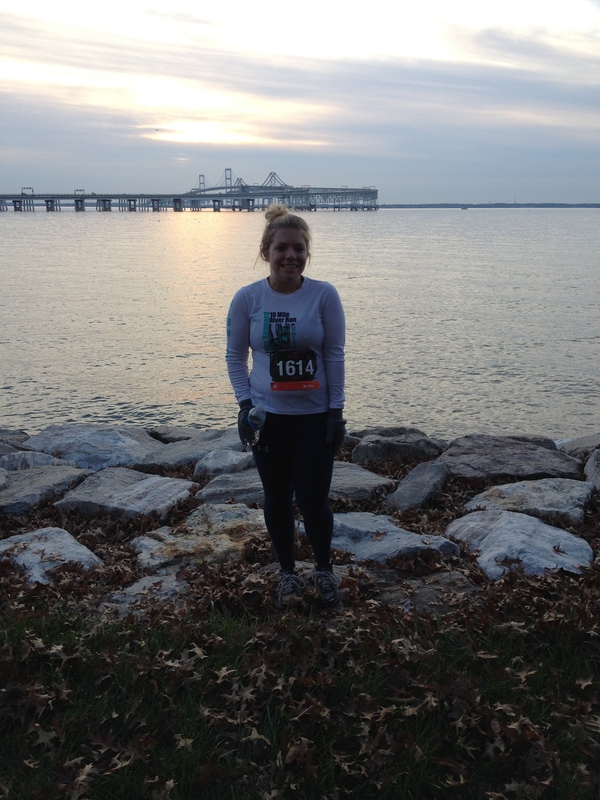 For this year’s race, I wore a long-sleeve tech shirt, leggings and gloves for warmth, because I figured it might be cold up above the Chesapeake Bay. However, I actually got a little bit hot, and took off the gloves. It was a nice day for a run. Of course, it was fun to run on a bridge that pedestrians normally aren’t allowed on. Even though I didn’t take pictures, I got to take in the unique views of the bay and of the bridge from a different perspective. When I got to the 5-mile marker, I felt like I had some extra energy. I feel like I did the last 1.2 miles pretty fast. After checking the results, I saw that I placed 17th out of 355 female runners in the 20-24 age group, which I thought was pretty cool. There were some ridiculously fast times out there today, and then I’m sure there were also plenty of people who were stopping to take photos and not running as hard as they possibly could. Since everything went better than I expected and I had fun, I decided I’d like to do the race next year, and I paid a fee to reserve a spot. I still haven’t decided for sure which fall marathon I might do — I’m thinking Marine Corps or Baltimore — but I figured I can always do the race slow and take photos if it’s soon after. Want to learn more about the race? Check out the race website or Facebook page, and check out the hashtag #beatthebridge on Facebook and Twitter. I was there!!! Following you now!